Which Touch Games are you looking forward to the most? I was going to do a poll but I was only allowed 10 options so I thought I'd create a list for you all to pick your favourites from! Let me know if I miss something. Although I don't really wanna list every Steam motion controller game so only let me know if it's one your looking forward to! The Climb - i'm putting off buying it because of no Touch. Unspoken and Dead & Buried. yeah originally I was putting it off due to not being able to handle any 'intense' comfort ratings but hopefully with Touch I'm hoping it should add a new layer of comfort to the experience too! Ripcoil , Wilsons Heart, Superhot VR and VR Sports Challenge. if so, and assuming it is supported, The Blu is my most anticipated app and has been for some time. Touch games? Do you mean there is 'adult content' games coming out ? Must I now have a dedicated 'VR room' in my house where all this touching should occur ? I believe this room is called a 'masterbatorium', but until now I've just never had a good reason to extend the house and build one. Unspoken, Wilson's Heart and Dead & Buried. ModBox - (not officially announced but developer said a definite). Already have Job Simulator and Fantastic Contraption (had, not have a Vive). Definitely looking forward to The Climb with touch controls - it is already one of my favorite games on the Rift. 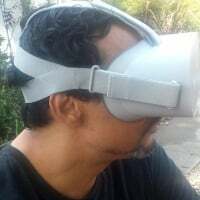 Oculus Medium sounds great also, I'd love to spend time in VR creating. Any game that has immersion instead of just presence. are we already at a stage where presence isn't enough? Well Touch will be another presence/immersion multiplier. I think multiplayer games will probably help a lot with the immersion you might be looking for! I am definitely excited about Unspoken, Dead & Burried, Oculus Medium, Killing Floor: Incursion, Ripcoil, Superhot VR, and Wilsons Heart.